I often make these because they are perfect as a treat in my lunch box. They provide me with energy but are not filled with sugar since the only sugar is from the raw cane sugar of the chocolate. You can use milk chocolate or even carob if you prefer. This is also a perfect treat for those with allergies since the chocolate rice cakes are egg free, nut free, lactose free, gluten free and vegan. If you are lactose intolerant check the chocolate you are using, most dark chocolates include some milk ingredients but to be sure, read the label. I used to buy these at my local health food store but they are so expensive, I refuse to by them anymore. They are quick and easy to make so there is no excuse for not making them at home. The simplest treat, but absolutely lovely and gluten free too! Place a clean, dry metal or glass bowl that fits snugly over the top of a saucepan. Transfer the chocolate to the bowl. Fill the small saucepan with water. Heat the saucepan over low heat until it begins to simmer, then turn heat off. Let the chocolate begin to melt, and then stir it gently with a dry spoon. When almost all of the chocolate is melted, lift the bowl from the saucepan and place on the table. Stir continuously until it is shiny, smooth, and completely melted. Pour chocolate into a shallow bowl and let sit for 3-4 minutes. 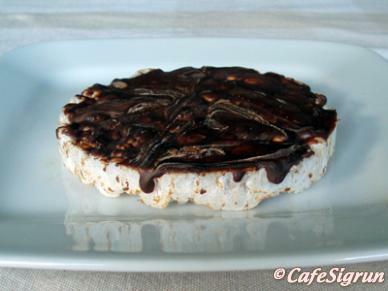 Dip rice cakes in the chocolate, transfer to a plate and allow to cool.